Shows the gauge which is currently most used in each country (main colour), with other significant gauges used depicted as small squares on top of the main colour. Grey indicates no railways. Feet and inches on the left, millimetres on the right. 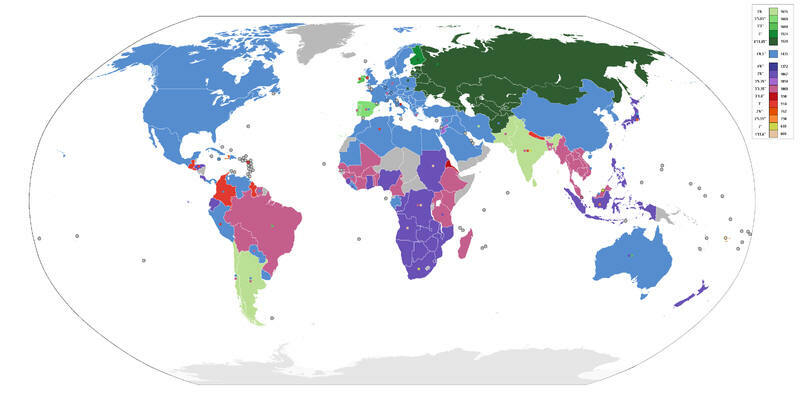 Green colours are broad gauge; light blue is standard gauge, used in Europe, Americas, China and Australia; other colours narrow gauge or no rail networks; dark green is Soviet broad gauge; light green is Indian broad gauge.